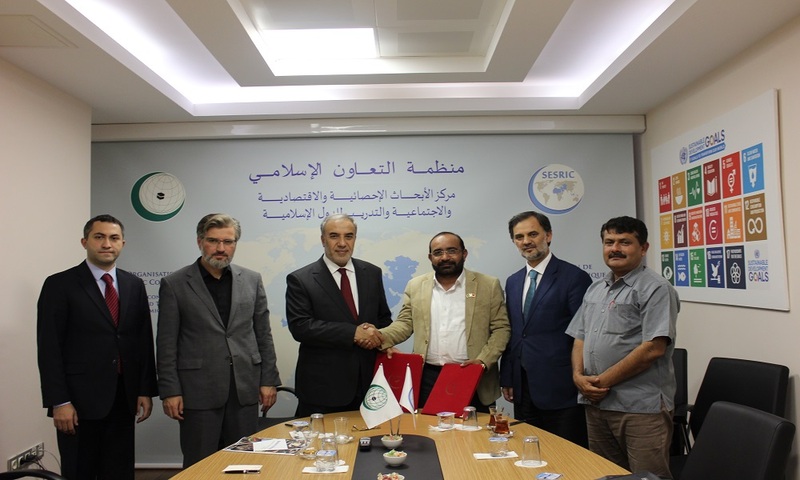 SESRIC and the NGO World signed a Memorandum of Understanding on 23 October 2017 at SESRIC HQ in order to enhance their cooperation on developing the capacities of NGOs in the OIC member countries. The partnership aims to conduct joint programs, studies and capacity building activities for the benefit of NGOs of the OIC member countries particularly in the areas of development and poverty alleviation. Moreover, it focuses on establishing networks of cooperation among NGOs of OIC member countries and development professionals. Following the signing ceremony, the Impact Assessment of the Barkat Project, which was conducted by SESRIC as a result of intense field study in Pakistan, was launched. The aim of the Barkat Project was to improve the livelihood of rural families living in poverty through generating income with a mutually shared business model and raising awareness for self-employment generation among rural farmers in Pakistan. The result of the Impact Assessment of the Barkat Project demonstrated the positive impacts of the project in terms of poverty alleviation and income diversity, and advised for replication within OIC region.